James McAvoy & Anne-Marie Duff signed 10x8 inch photo. James McAvoy & Anne-Marie Duff, signed 10x8 inch photo. 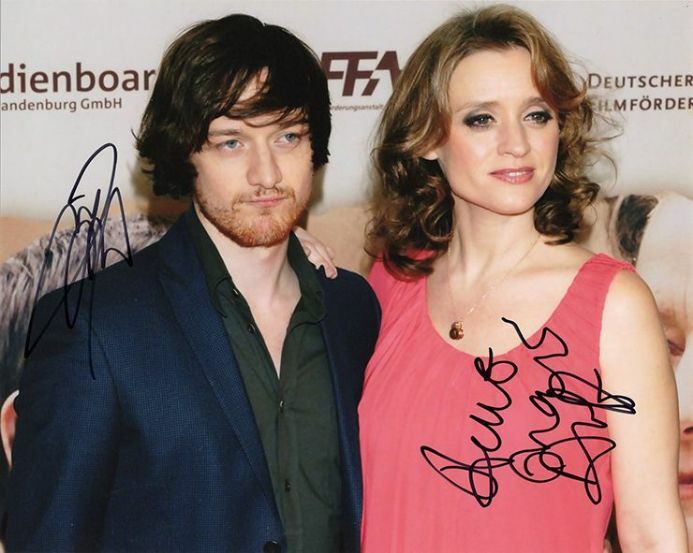 10x8 inch colour photo personally hand-signed in black sharpie pen by Scottish actor, James McAvoy, and English actress, Anne-Marie Duff. McAvoy's notable television work includes Shameless, Early Doors and State of Play. His films include The Chronicles of Narnia: The Lion, the Witch and the Wardrobe (2005), The Last King of Scotland (2006), Wanted (2008), X-Men: First Class (2011) and X-Men: Days of Future Past (2014). Duff has had film roles in Enigma (2001), The Magdalene Sisters (2002), Nowhere Boy (2009) and Suffragette (2015). The pair married in 2006 after meeting on the set of Shameless.